Book Soon!We predict that within three weeks, only 1% of Seaside Heights properties will be left for your dates. Property 1: Single Family Home With Porch -Only 6 Houses From The Beach! Property 2: Seaside Retreat Cottage has been totally renovated and lots of backyard space! This property is already 67% full in September. 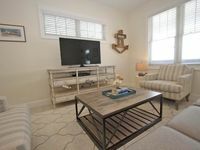 Relax with your family at our Seaside Condo! Property 7: Relax with your family at our Seaside Condo! Fully Renovated Townhouse -- 5 minute walk to Beach and Boardwalk!! Property 10: Fully Renovated Townhouse -- 5 minute walk to Beach and Boardwalk!! Property 13: Beautiful! 2 blocks to boardwalk, beach, restaurants and rides! Newly remodeled. Property 14: 3 BR / 2 Blocks To Beach / Newly Renovated / Big backyard! Luxury beach townhome with ocean/beach view from private rooftop deck. Property 17: Luxury beach townhome with ocean/beach view from private rooftop deck. Lowest daily prices in the area! Seconds to Seaside Heights beach & boardwalk! Property 18: Lowest daily prices in the area! Seconds to Seaside Heights beach & boardwalk! Seaside Heights Condo w/Deck - Walk to Boardwalk! Property 23: Seaside Heights Condo w/Deck - Walk to Boardwalk! Property 29: New house 5 BR/5BA walking to beach/board walk. Close to the ocean and a pool too! Property 39: Close to the ocean and a pool too! Property 41: 2 Bedroom Unit Available - Contact Us To Book Now! Wonderful host ! Very clean and comfortable!! Great stay and wonderful owner to work with. Really great and comfortable stay. Would definitely stay again as owner was wonderful to work with. One thing that could have made it a tad better would have been tv&rsquo;s in all bedrooms but other than that verything was great!!! Don&rsquo;t think twice about renting this beautiful home.